These look real, but they are not! 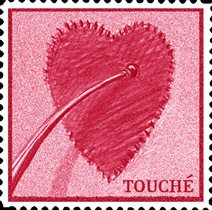 Faux postage stamps can be designed to be used for your return address. They can describe your business. They can be used to decorate your wedding invitations, too. This one was designed for a couple who met at a fencing class.